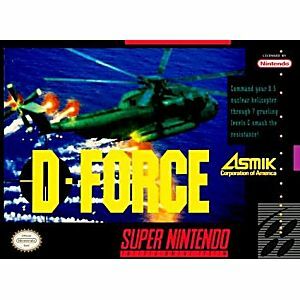 D-Force SNES Super Nintendo Game Cartridge Cleaned Tested and Guaranteed to Work! You've got the fastest bird to be had, but we're not sure you can handle it. 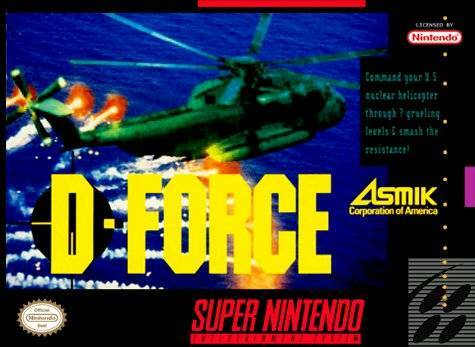 If you're quick enough, you'll command the latest Nuclear Apache Helicopter, D-Force, through 7 bone-crushing levels. You'll roam six countries on your seemingly endless search for a powerful oil-rich Mid-Eastern Dictator. If you fail, we'll all be learning a new language soon! Comprende? We've created the most intense, physically demanding game around! 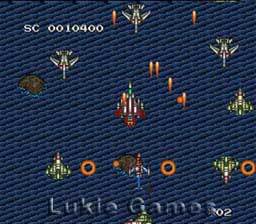 With selectable weapons, quick zoom, 16 bit graphics, and a massive 8 MEG game pak, we don't want to hear any whining. 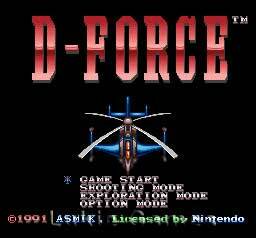 D-Force utilizes thousands of colors and special effects, giving you the ultimate test on the Super NES. D-Force is nearly impossible & downright unforgettable! A simple and easy to understand shooter game.